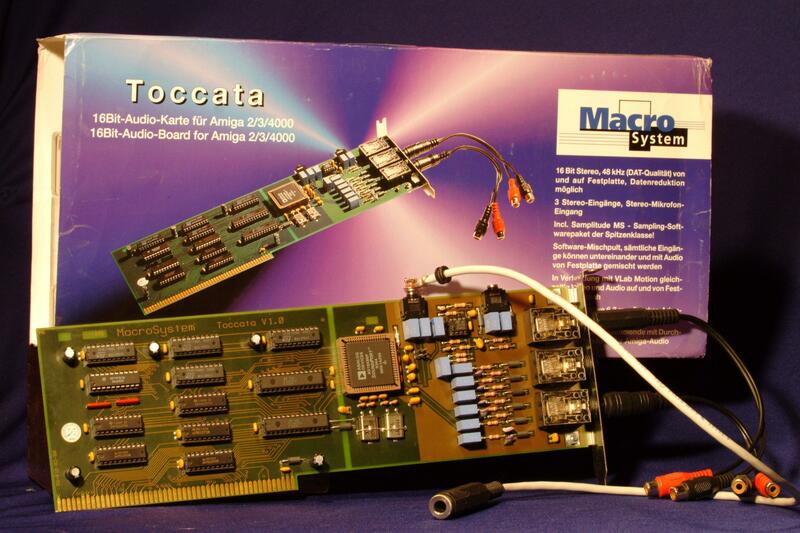 The Toccata is a full length Zorro II 16 bit sound card which is also capable of 16bit sampling at up to 48Khz with ADPCM compression (1:2 and 1:4). The Toccata contains an onboard mixer for mixing the Amiga's native audio with that of the Toccata and supports frequencies of 10Hz up to 20Khz. It uses the Analog Devices SoundPort 8530 codec. Up to five Toccatas can be used simultaneously in the same Amiga. If more than one Toccata is present they can be combined together to provide more sound channels. Each card requires it's own copy of the toccata.library which should be renamed to toccata1.library for the second card, toccata2.library for the third and so on. Page contributors: Antoine Dubourg, Martin Cornelius, RiWa & Friends, Sebastian (Exin), Txema Latas, Ulrich Sprenger.